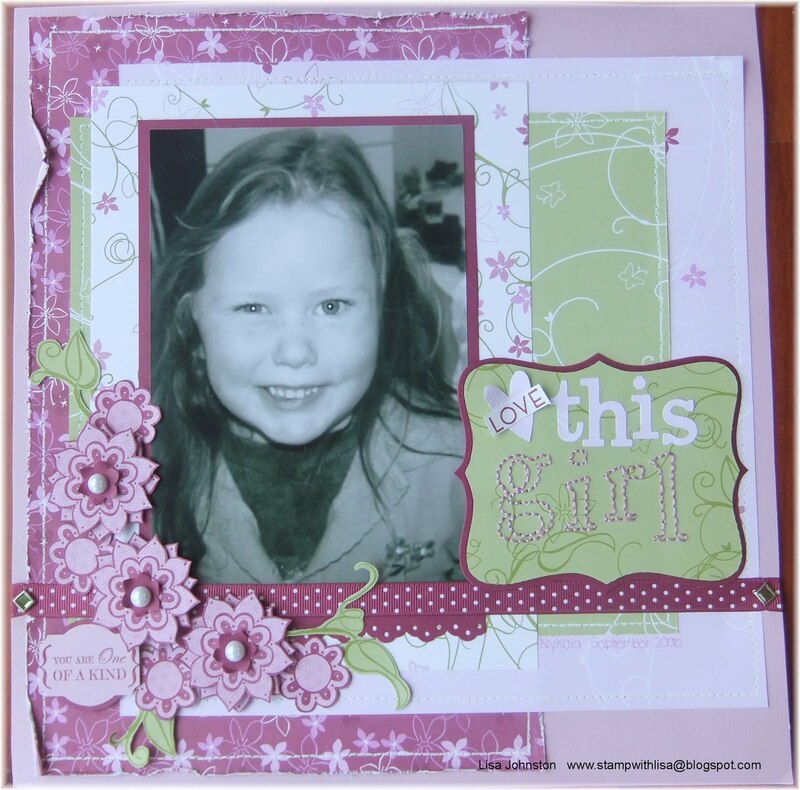 This is a page on my cute niece Nykola. It was going to be my entry to the Just Add Ink add stitching challenge but with all the computer issues I had it was never entered so I thought I would share it with you all today. There are a couple of things I really love about this page. The first is the handstitched titled. It was very easy to do by stamping my title with the Jumbo Outline Stamp Set and then using my paper piercer to pierce holes for my stitching. The second thing I love is the layered flowers. I used the One of a Kind stamp set and stamped with Rich Razzleberry ink on to a sheet of orchid paper from the Cottage Wall set of papers. I also cut some leaves from one of the other sheets of paper and layered those in there as well. The stitching around the edges was done with my paper piercer and white gel pen and yes it did take ages. I really need to dust off my sewing machine ...I had forgotten how much I like the look of stitching on my scrapbook pages. I have used two of my new favourites with the Top Note Die and Timeless Type alphabet for my bigshot machine. I love love love that alphabet. 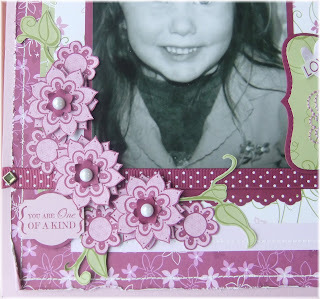 Some pearls from the Pretties Kit, Rich Razzleberry Ribbon and Rhinestone brads finish off the layout. Now if you would like to get hold of the Big Shot for your own scrapbooking and cardmaking I have a special bundle deal available. Plus Level 1 Hostess Set and $30 free product of your choice. You pay only $300 with free postage. A payment plan of $100 per month is also available with the products being delivered after the last payment. Contact me to order your Big Shot Bundle this month and I will also include a free cardmaking class using your new Big Shot machine.